­The flights conducted by Russia’s strategic Tu-95MS bombers over the Pacific Ocean have once again outraged the Japanese. Our aircraft have long returned to the far eastern airfield of Ukrainka, but Tokyo continues to address angry shouts at Moscow’s. This happens each time our strategic aircraft carry out air patrols over the neutral waters of the Pacific Ocean. According to international law, this route, on the very far eastern border of the country, is several dozen kilometers away from Japanese shores. The flight zone used by the strategic bombers is indicated on military maps, and Tokyo is notified about departure in advance. However, the neighbors, who disagree with this “demarcation”, demonstratively ignore all alerts, consequently practically accusing the Russian pilots of violating state sovereignty. They react accordingly by putting their interceptors to the sky. The latest incident, which happened in Russia’s Far East on September 8, was no exception. 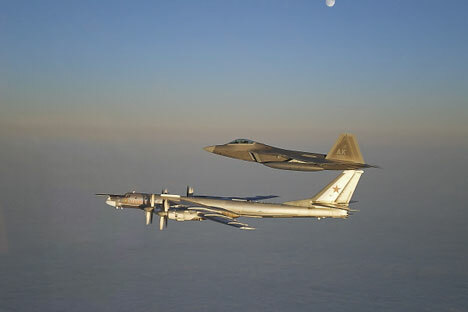 In the hope of chasing away the unwanted guests, ten Japanese F-15 and F-4 fighter jets escorted our bombers. The pilots were not instructed to attack the Russian aircraft, but did everything possible to make sure that the two Tu-95MS jets, nicknamed “Bears”, immediately returned to their shores. This is not the first time our crews have been subject to this kind of pressure – and in this battle of nerves they had the last word. Having spent the planned 19 hours in the patrol zone, the jets returned to the airfield only after completing their assignments. Checking up on neighbors’ military maneuvers is a standard practice of any army. However, Tokyo has perceived the actions of the Russian aircraft as provocation. Meanwhile, there clearly had not been any international law violations or hostile actions towards Japan. Russia’s Defense Ministry spokesman, Vladimir Drik, explained to Rossiyskaya Gazeta (RG) that the two Tu-95MS aircraft were conducting the flight as part of the training program of the Pacific Fleet. In other words, our aviation constantly conducts flights in this part of the ocean. And the Russian generals did not believe it was necessary to alter the flight plan just because our neighbors consider the area to be their territory. Moreover, the Chief of the General Staff, Nikolay Makarov, confirmed that no one is planning to stop conducting the air patrols due to the political stance of Japan or any other country. “We will continue to conduct strategic aviation flights,” said Makarov. Our Foreign Affairs Ministry has also reacted to Tokyo’s protests. In a statement published by the ministry, it is stated that the Tu-95MS were patrolling over neutral waters in strict accordance with international law and without violating the borders of other states. Moreover, a notice of the aforementioned flight by the Russian Air Force was given to the Japanese in advance, in accordance with the accepted worldwide legal procedure. Therefore, our pilots’ actions cannot be classified as posing a threat to our neighbours nor are they indicative of Russia’s “hostile intentions” in regard to Japan. “If such opinions do exist in Tokyo, then they are absolutely baseless,” reads the document. Meanwhile, it’s no secret that all of Russia’s large-scale military exercises in the Far East are monitored by the Japanese. Some information is obtained by them from spy satellites. Their reconnaissance aircraft constantly patrol over our naval training sites. Neither is other combat aviation on island airfields left idle as they constantly conduct flights towards Russian shores and military bases.